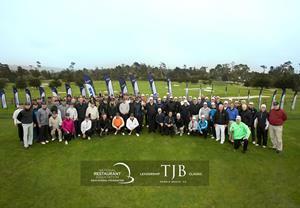 /EIN News/ -- Washington, DC, March 26, 2019 (GLOBE NEWSWIRE) -- The National Restaurant Association Educational Foundation (NRAEF) raised a record-breaking $1.6 million during its 27th Annual Ted J. Balestreri Leadership Classic in Pebble Beach, California. The 27th Annual Ted J. Balestreri Leadership Classic raised a record-breaking $1.6 million in support of the next generation of restaurant, foodservice and hospitality leaders. The overwhelming support will continue to advance the next generation of leaders in the restaurant, foodservice and hospitality industry. The highlight from the three day golf event includes a $25,000 gift from Pebble Beach in honor of Ted Balestreri and in celebration of the joint centennials of the National Restaurant Association and Pebble Beach. The 28th Annual Ted J. Balestreri Leadership Classic will be held March 25-28, 2020.